Rheumatoid Arthritis | Redefining "Good"
…a bit belated. I hadn’t realised it had been so long since I updated, but the holidays will do that to you. I barely know where to start, really. We had cycles of very cold (for my region) and then unseasonably warm weather which played havoc with my arthritis, in particular my hands (not to mention things blooming unseasonably, so allergies are in full swing already). The tendinitis “trigger thumb” in my right hand has been very painful and even with wearing a splint at night it still wakes me up at times. In fact, my overall pain got so bad that I went on a ten-day taper of steroids to help put it in check (which I loathe doing). It helped, for the most part. All this has been a bit more hectic since my rheumatologist has left the practice and relocated outside of my area. I haven’t met my new “temporary” doctor yet, but had to get bloodwork done to renew my prescriptions. Thanks to changes in my supplemental medical coverage this ended up being a three-way paperwork fest which was finally resolved as of this morning and resulted in me missing only one week of medication. It has been stressful, to say the least, in addition to trying to dodge round after round of colds and flu at work. I had actually managed to accrue some sick time at work and then had to use it all on a chest cold that took out half of my team (luckily I had a light variant, but I am constantly wiping everything down with antibacterial cloths). Without going into too much detail, I also began seeing a women’s doctor again. With the medications I take it’s not safe if I became pregnant, but the medication I was taking was having significantly bad side effects. Just as I get a referral and have an introduction appointment I’m notified that the new doctor’s practice and my health insurance have not renewed and the end date is alarmingly soon, so I was in a rush to get my meds changed before the cost-off. I was able to my medical appointment done and now am adjusting to the new medication, but I feel like it’s a taste of the direction that women’s medicine has been going in this country for quite a while now. I’m not going to go into politics here, but it added significantly to my stress, which I did not need in the least. In good news my left foot is much better with just a little stiffness in the early mornings, which is probably the new normal. My Christmas gift to myself was a reclining bicycle, and hubby’s gift was cleaning up the spare room to make space for it. I only used it twice last week, so my goal for this week is three times. I have had to start much slower than I expected (10 minutes 30 seconds and 12 minutes 30 seconds respectively) but I am still adjusting settings. Building up my thighs will help my right knee not overextend, so it’s better not to push too hard. I feel like it is already helping my lower back which has been particularly bad this past week- so any progress there is welcome. Not much else going on, really. I haven’t seen The Black Panther yet thanks to an unfortunate migraine yesterday, but will definitely see it this weekend- I’m so excited! It looks gorgeous and everything I’ve heard has been glowing so far. One other gripe- I am still trying to adjust to diet to help avoid kidney stones. Hubby asked for a list of what I *can* eat since the list is getting so short. I really wish he was joking. It’s frustrating to say the least. Oh- and I received all my medical statement summaries for last year. Without insurance I could have covered my prescriptions and had $5,000 left of my income. Which means that with my medical bills I would have been $35,000 in debt. I am grateful every day for my insurance- I honestly don’t know how I would be able to work full-time without it (which of course is it’s own source of stress, since I need to keep working to qualify, not to mention that hubby is covered under my insurance). I haven’t updated here in a very long time, mostly because no news is (usually) good news. The other option is when I’m hit by one thing after another and it takes a while to get to a place where I can actually look back and summarize what’s going on. Sadly, recently it’s been the second option. Let’s start with plantar fasciitis. (Yes, I know I spelled it wrong in my Categories tag- I’ll fix it… eventually.) A few months ago (? six? I honestly don’t remember how long this has been going on) I started having severe pain in my left foot that made it difficult to walk. Since starting with a podiatrist I have stretched, iced, medicated, gelled, electro-therapied, splinted, spent way too much on increasingly specialized sneakers, inserted and padded my foot. This has gotten me to be mostly mobile but with possible Achilles tendon issues and a stress fracture in my foot. (Remember the Year of Foot Fractures? Sadly, I do.) In all, I am better than I was, but not being able to walk reliably has led to weight gain that I really don’t need. I am progressing, just very slowly. Hurricane Irma. That worked out much better than expected, with my pharmacies being very proactive in making sure I had enough meds until things were back to normal (apparently they learned some painful lessons with Harvey that they didn’t want to repeat). I am deeply grateful for this. The aftermath was hot, muggy, and I chopped off my hair. We had water but cold showers could only do so much and my hair. Just. Didn’t. Dry. A minor injury on my spouse’s part kept me very busy and I was pretty exhausted by the end of it all, despite work being closed for a week. My rheumatoid is doing well. Sadly, my liver is acting up. My biologic medication can impact my liver. Tests are ongoing. I am already off my cholesterol meds and have blood work scheduled next week so wish me luck. I… could say a lot more about my whole experience. The EMT who couldn’t get my vein because it kept rolling- I forgive you even if it meant blood running down my arm and terrible bruising, but dang I could have lived without that on top of everything else. I am wearing long sleeves while it heals- the bruising for my IV is already gone. Overall, for an unexpected admission I did pretty well. Hubby was fantastic and grabbed my medical emergency sheet and stack of prescriptions, which was useful. Mostly it was a lot of waiting. Hopefully, I just need to drink more water *crosses fingers* because there are more stones in there and I VERY much want to never go through that again. I was just grateful that it waited until I was back from the rural mountains of New Hampshire or that would have been a much, much worse experience. And then there’s the fact that my right knee sounds like crinkling cellophane when I walk down stairs. I don’t even have an appointment for that yet since there’s no pain and I’m pretty sure they’re just going to tell me it’s arthritis. I’m dealing with one crisis at a time here. In good news a cold front came through so we have cool, dry weather and I got to wear one of my sweaters today- yay! And I am forever grateful for my insurance- we are still covering hubby’s medical bills from his ambulance ride and hospital visit for a sliced finger (the night before Irma hit no less. We waved at his room as we left the hospital after my stay). Overall I am- tired. And my stomach is easily made unhappy, but I am much, much better and dealing. Oh! And no allergy shot for me this week- I picked up four fire ant bites over the weekend. Thankfully, this is my last vial- once I use it up no more allergy shots! It only took five years! About six weeks ago I started Enbrel. It’s been a challenge (mostly, a challenge to deal with my fear of needles so I can self-inject once a week). It’s not getting easier, but I’m more confident that I’m not going to do myself serious injury in the process. It’s hard to say how much impact it’s having- it’s still pretty early in treatment, but my energy is better and the arthritis in my feet and toes is hugely improved, which helps me get on the treadmill and is always a good thing. I do find myself getting fatigued more easily and sleeping more/taking naps on weekends, but hopefully that’s just part of the adjustment process (whether to the medicine, the exercise, or both). The biggest positive outcome is that I am now off the sulfsalazine (which didn’t seem to have any effect on my RA whatsoever). That means four less huge pills a day and they’re not turning my hands and other pills yellow any more. Yay! If all continues to go well in the next couple of weeks I can taper off of Prednisone (which would make me SO happy). It’s hard to think that I have been trying to treat my RA for nine years now and we’re only just starting on biologics. I track when I stop medications, and it’s a long list of trying different things with only partial success. It’s not a magic cure (if only! ), but the rate of temporary remission is fairly high and I have hopes. It’s not likely that I’ll ever be 100% pain-free, but any reduction is welcome. I haven’t updated in a bit and there’s quite a lot going on. For one, I am doing a fair job of keeping up with exercising a minimum of 30 minutes a day at least four times a week. I’ve been able to walk longer (up to 40 minutes) but I’m not always able to make it five times. I’m allowing myself some flexibility so I don’t push too hard. I had a turned ankle that slowed me down for a couple days, and my knees are occasionally cranking up, especially with the cold turn the weather has taken. I need to work some of my PT for my knee and shoulders back into my schedule but haven’t quite sorted that yet. I had a terrible pain flare yesterday, mostly in my thighs and knees. It took me most of the day to figure out what triggered it- I had topped off the air in my tires Monday after work and squatting and bending must have done it. I am still stiff and sore today, but not nearly as bad as yesterday. It might not have been such an issue, except my rheumatologist has put me on a 15 day taper-down of prednisone, so I’m not taking my daily naproxen until that’s done with. I had fresh x-rays of my hands yesterday, as well as feet to see what’s going on with my toes. The increased exercise could be aggravating the arthritis there and there is some swelling. I have bloodwork scheduled this week as well, so all that will hopefully tell us something. I totally missed an opportunity; I should have copied it and then I could do the same pattern in several different colors/patterns. I *might* get myself a second book just for masters. I might also be getting ahead of myself here. 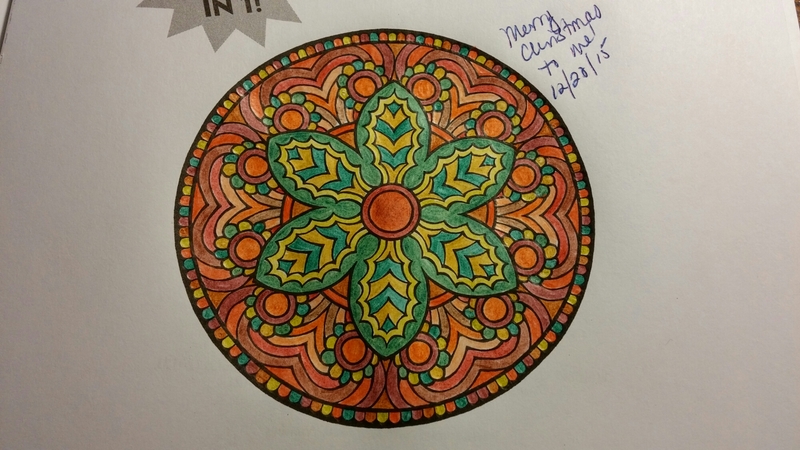 I am slightly disappointed in the color pencils- there is a serious dearth of reds. If I want a maroon or a burgundy I have to try and blend it myself. I may eventually splurge and buy a larger pack for more options (and then I’ll have duplicates of the most common colors). 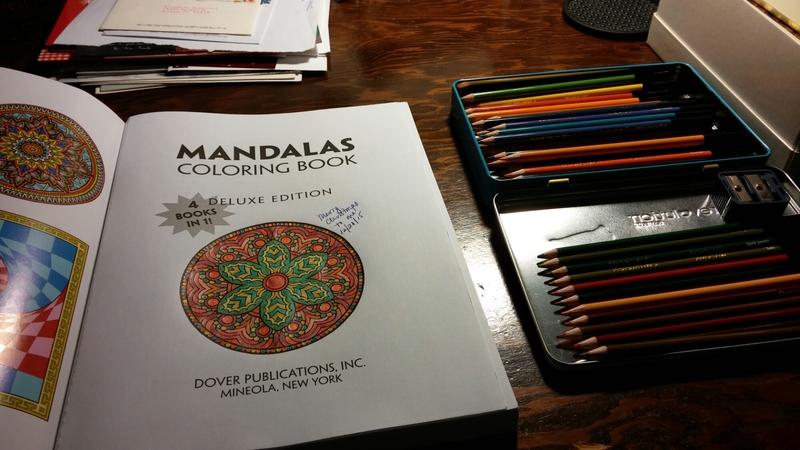 Colored pencils are misleading. The pencil looks green but is named “tan”. The color is neither what I think green or tan should be. I will probably make myself a color swatch guide going forward. If I’m going to do this regularly I need to invest in some pencil holders, maybe like these. I may have given myself a blister, I’m so unused to using a writing implement for long periods of time. I still have a writer’s callous, but I gave it a real workout. I need to lay a thick sheet of paper or shin cardboard in-between pages. The color may not come through, but the page beneath the one I’m drawing on gets embossed in the process. Update: Yep, finger tips are tender. I made myself a swatch reference sheet to keep in my pencil box- I occasionally have trouble telling shades apart, but there are at least two pencils that I swear are the exact same color. I also added a #5 note above as well. Feeling a bit stiff today, but it’s for a good reason! I have been sticking to my walking schedule as best I can, pacing myself and ramping up slowly. Not only am I now walking a minimum of 30 minutes each day that I walk, but for the first time I walked three days in a row! This means that, in theory, I can finally meet my 5x a week walking plan (150 minutes a week). I have walked up to 35 minutes a few times, and usually do at least a quarter mile at a low incline to build up my thigh muscles (which helps my knees). I haven’t walked this regularly since hubby and I were doing 5ks a few years ago. My FitBit had an update recently and it now tracks my sleep time automatically. Before I had to toggle it on and off manually, but with my medical band that was difficult to do (and since it is controlled by tapping, my hands were often an issue). So far it seems to be tracking accurately and it’s a great feature! I do need to replace my current band which is wearing out (the metal medical band that I wear on top is probably contributing). I’m hoping for an after-holiday sale that I can take advantage of. In January I will start tracking what I eat again- I’m focusing on maintaining my walking schedule for now and will give myself a free pass on food until after the holidays. This means I’m not losing any weight, but I’m also not stressing out over food. I have lost some inches around my waist and ordered new jeans in a smaller size- here’s hoping they fit okay! I am also keeping a close eye on my sneakers and may replace those in the new year as well- walking on the treadmill wears them smooth after a while. I am way behind on holiday anything. I did get the door wreath up and the lights on the front bushes, and brought some ornaments to hang on my team’s tree in the office. With the kittens were are probably going to skip the tree at home entirely this year. We’ve gotten a few cards so far and I intend to send some but am still working out holiday gifts (looks like my packages will be going out after Christmas again this year). I’d like to do more, but I’m also trying to pace myself and maintain my sanity. The disadvantage to exercising is it takes a chunk out of my evenings since I then need to shower afterwards, but in the long run I know it is better for me. I am practicing allowing myself to not do things- it’s almost as challenging as walking on the treadmill. I do think exercising regularly is helping my anxiety some- whether it’s endorphins or just physical stress relief I’m not sure. I’m not listening to music while I walk right now- I think having time to just quietly zone is probably good for me. Exercising is helping my digestive issues also, so it’s just all-around a good thing for me. In time I’d like to start using light weights again, but I think that will wait for January as well- I want to make exercising a solid habit.